A Paris All Your Own is edited by Eleanor Brown and includes contributions from Michelle Gable, Jennifer Coburn, Cathy Kelly, Julie Powell, Lauren Willig, Therese Anne Fowler, Maggie Shipstead, Meg Waite Clayton, J. Courtney Sullivan, Ellen Sussman, Susan Vreeland, Megan Crane, Paula McLain, Jennifer L. Scott, Cara Black, and M.J. Rose. When my husband and I retired, we decided that we would travel as much as we could afford. We have been lucky enough to have traveled all over Europe plus places like Budapest and Prague. Every new city we go to gets compared to our favorite city to visit - Paris. We have seen all of the major sites there and now our favorite things to do in Paris are to walk (and often get lost) and people watch. I must admit that we've found some of the most amazing things when we were lost - little parks and out of the way museums. Because of my love of Paris, I have really been looking forward to the new book edited by Eleanor Brown called A PARIS ALL YOUR OWN. 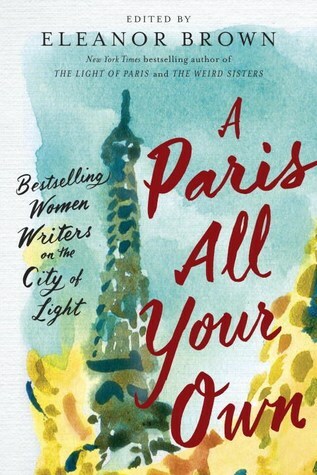 This book is a compilation of essays by 18 female authors who have written books about Paris. It details their love or lack of love of this great city. As with any anthology, some of the essays were fantastic and some were so-so but together they made this a fantastic book to read. So whether you've been to Paris and want to have your memories re-kindled, it's on your bucket list of places that you must visit or you just enjoy reading books about Paris, this is the book for you to read. I loved Michelle Gable's essay "Too Much Paris" about a trip she took with her husband, mother and father, and two daughters ages 8 and 10 during one of Paris's heat waves. I laughed out loud at her descriptions of climbing stairs and trying to keep her daughters engaged in what they were seeing. I mean how thrilled is an 8-year-old going to be to see Monet's water lilies. I also enjoyed Susan Vreeland's essay "A Myth, a Museum and a Man" about getting behind the scenes at the Louvre and the man at the museum who helped her gather information for her novel in places where the public doesn't usually even get to see. "We'll Never Have Paris" by Jennifer Coburn tells about her taking her mom to Paris so that they can spend more time together and how much her mom disliked Paris. This was another laugh out loud essay. And the last essay in the book was one of my favorites "Thirty Four Things You Should Know About Paris" by Meg Waite Clayton talked about rainy days in Paris with lots of information about food and wine. At the end of each essay, each author gave more information about themselves and their Paris travel - favorite book about Paris, best things to see in Paris, what you can skip and songs you like about Paris. Overall, this is a fun book to read while you are dreaming about having your picture made at the Eiffel Tower and seeing the Mona Lisa at the Louvre.